Welcome to Gertrude’s Children’s Hospital Pathology Department. As our Department continues to grow, effective communication has become increasingly important. Currently, there are over 40 qualified staff in the department, including 4 pathologists. Employees are based not only at the main laboratory at Muthaiga, but also in all satellite clinics. Internet access availability at all these sites ensures quick and effective communication with all these sites. Clinicians, students, prospective trainees and employees are encouraged to find out more about the activities of the Department. Gertrude’s laboratory offers our clients accurate, precise and meaningful results with an acceptable speed of delivery (Turnaround time – TAT). We ensure the highest level of customer service. 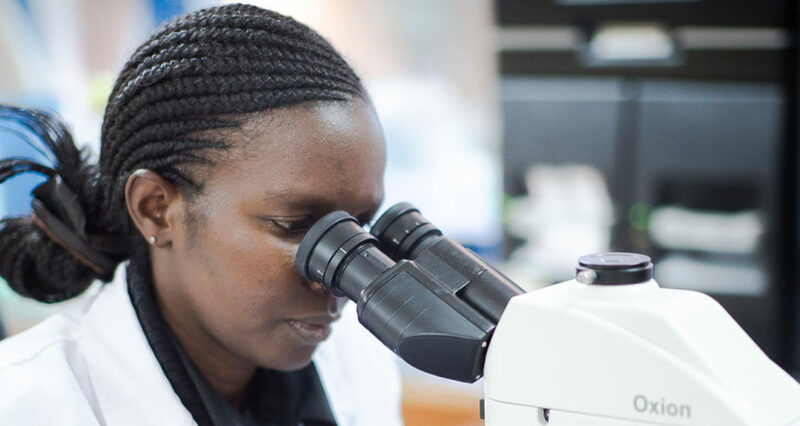 We offer a range of tests from standard pathology tests in haematology, histopathology, cytology, microbiology, virology and clinical chemistry to specialized tests such as, neonatal screening, HIV viral loads and paediatric IgE panels. Our results are reported with reference ranges where applicable to aid in clear interpretation to assist diagnosis. Relevant comments to make the reports meaningful are also provided. Email reports are available on request and hard copies at the clinician’s door step. One-on-one consultation with specialist pathologists is available for review of test results. Our services are easily accessible with satellite laboratories located in various areas of Nairobi. We have courier services skilled in handling medical samples and to routinely deliver the reports. We ensure transparency by generating electronic receipts and invoices which have helped avoid double entries. We offer modern mortuary services with a capacity of six to twelve bodies; we also store and offer post mortem services at subsidized rates. We have trained paediatric phlebotomists with a wide expertise, available 24 hours at our main hospital (Muthaiga) and during all operational hours at the satellites. Quality is key to excellence. At Gertrude’s laboratory quality assurance is a core value to enable us to achieve our mission and ultimately our vision. We ensure quality in all phases of the analysis (pre-analytical, analytical and post-analytical). To enhance quality we employ qualified staff and use modern state of the art equipment which is optimally maintained. We operate on a quality management system which is reviewed semi annually. To meet international standards in laboratory testing the laboratory is engaged in external quality assessment. Gertrude’s children’s hospital laboratory is run by qualified professionals comprising of pathologists, technologists, clerks and lab assistants supported by the hospital administration personnel and IT Department. All this members are committed in achieving our vision. In terms of our training programs, we have had 13 CME and I training ongoing for total quality management. A new institutional and Departmental initiative this year is to focus our efforts to increase the diversity of research in the department. The Department has developed and implemented a plan which we believe will help us achieve this important objective. A training diversity committee has been established headed by David Kimani and Charles Kinoti respectively, to spearhead these efforts. In addition we train students on internship/attachment from our local colleges and Universities.